KALDEWEI, Ahlen, April 2019. – When historic architecture and modern interior design are skilfully combined, the result is inspiring rooms – perfectly demonstrated at the Hotel Indigo Warsaw Nowy Świat in Warsaw. 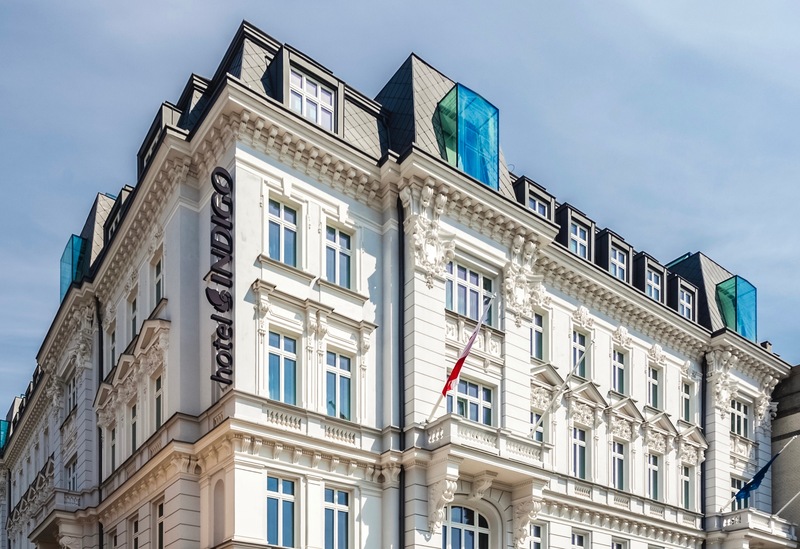 This stylish 4-star boutique hotel, owned by the InterContinental Hotels Group, is housed in a listed building, over 100 years old, on cosmopolitan Nowy Świat Street. 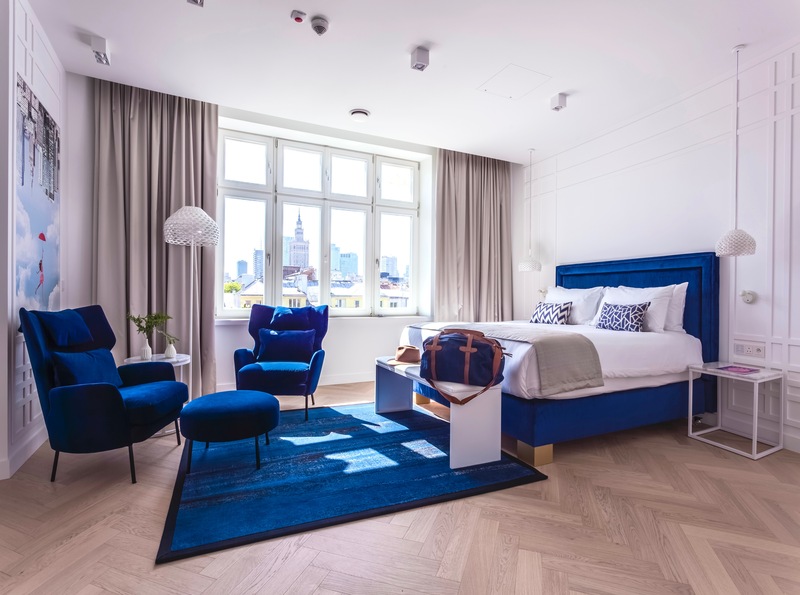 Later contemporary extensions, some with wraparound glass, afford not only a magnificent view of the old town and the Polish capital’s skyline from all the rooms, but also provide a suitable frame for a minimalist interior with vibrant splashes of colour. 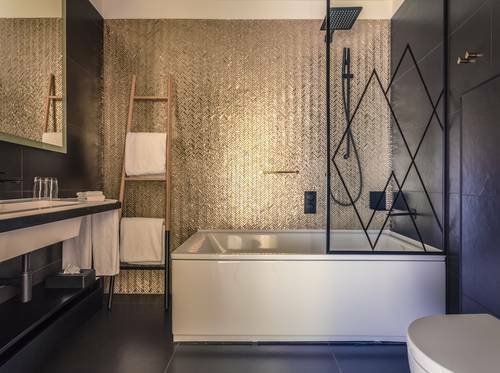 As the perfect complement to the interior decoration, the hotel has chosen enamelled bathroom solutions from Kaldewei which guarantee a comfortable showering and bathing experience in the 60 rooms. The building, Smolna40, which features playful decorative facade elements, was once the residence of Count Branicki and is in one of the city’s most picturesque areas which links contemporary and historic Warsaw. Destroyed during the Second World War, it was rebuilt in the 1950s and later a modern mansard roof and an annex with wraparound glass and a terrace were added based on a design by architect Bogdan Kulczyński. This produced an attractive mix of styles that runs through the entire hotel. Bright rooms with elaborate stucco and elegant columns contrast with the 60 bedrooms that embrace a more minimalist look in plain shades of white and grey. 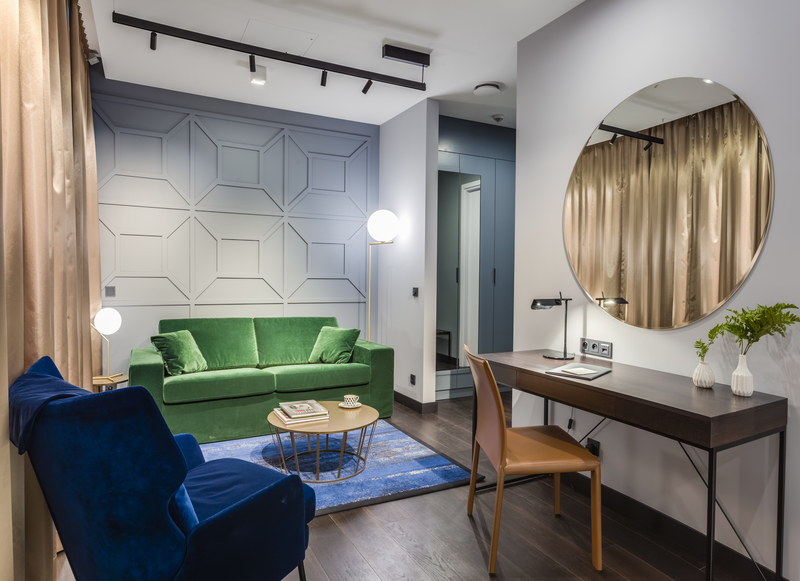 Throughout the hotel, coloured furniture creates exciting highlights that put their own spin on the palatial style of 19th century mansion flats. 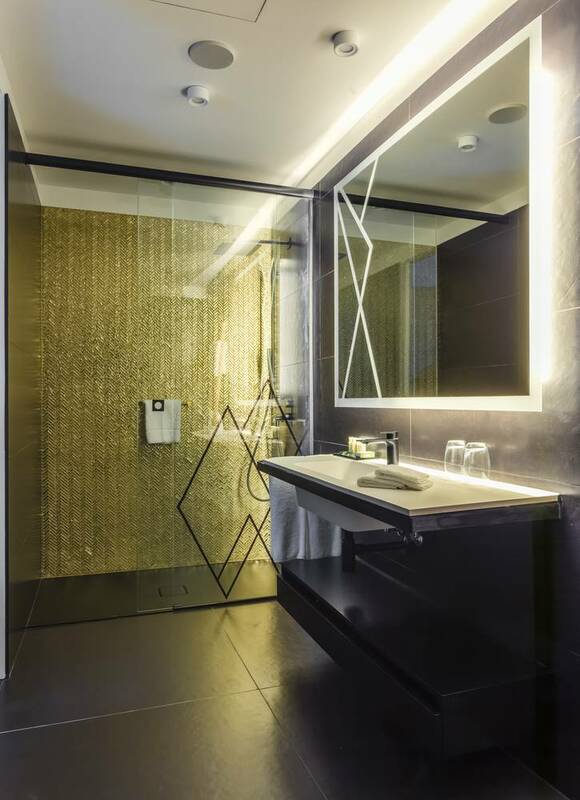 The bathrooms reflect the property’s exclusivity and individuality. The Hotel Indigo chose bathroom solutions from Kaldewei which offer the perfect fit for the bathroom, thanks to their design language and superb quality. The baths from Kaldewei’s clean-lined, minimalist Puro line possess a persuasively unfussy elegance and, like all bathroom solutions made of Kaldewei steel enamel, are made of an exquisite material. As a highlight, the freestanding Meisterstück Centro Duo Oval brings timeless elegance and calm into the bathroom of the Superior Premium room. In a further 47 rooms, the Conoflat floor-level shower surface ensures a luxurious showering experience, while offering the greatest safety underfoot: because the shower surfaces in the matt shades of Lava Black and Alpine White from the Coordinated Colours Collection feature the anti-slip properties of Kaldewei’s Secure Plus finish. Kaldewei shower surfaces, washbasins and baths are chosen for top hotels all over the world. 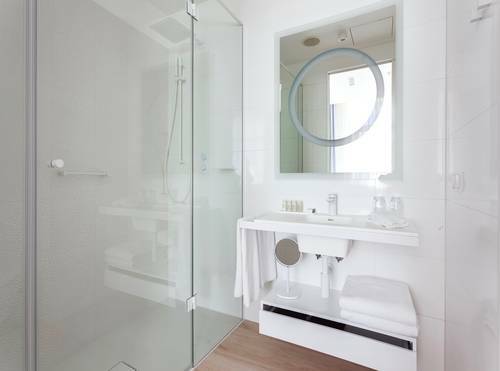 The enamelled bathroom solutions, not only meet the highest aesthetic requirements of hoteliers and their guests, but are also extremely cost-efficient thanks to Kaldewei steel enamel’s longevity and ease of maintenance. Another point in their favour is: the intelligent surface finishes such as anti-slip Secure Plus which can optionally be annealed - heated and allow to cool slowly - in order to remove internal stresses and toughen it onto the steel enamel surface and which ensure the greatest possible safety underfoot in the shower. The building, Smolna40, which features playful decorative facade elements, was once the residence of Count Branicki. The double rooms at the Hotel Indigo Warsaw Nowy Świat are minimalist and decorated in shades of white and grey, in which vivid colours create exciting highlights. The building, over a century old, was reconstructed after the Second World War. This gave rise to an appealing mix of styles that runs through the entire hotel. 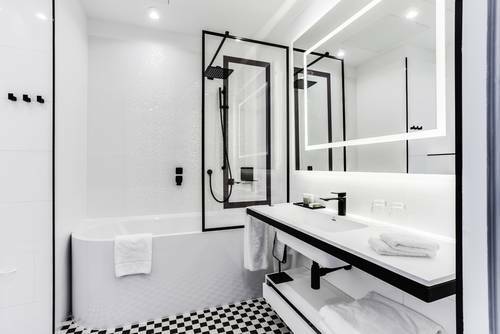 Eleven baths from Kaldewei’s clean-lined, minimalist Puro range in the rooms of the Hotel Indigo Warsaw Nowy Świat possess an unfussy elegance and are made of an exquisite material. As a highlight, the freestanding Meisterstück Centro Duo Oval brings the luxury of timeless elegance and calm into the bathroom of the Superior Premium room. A vast range of models and superb quality is what sets Kaldewei bathroom solutions apart, ensuring an extra-special showering experience. In the bathrooms, some of which are decorated in dark shades, the Conoflat is presented in Lava Black matt from the Kaldewei Coordinated Colours Collection. 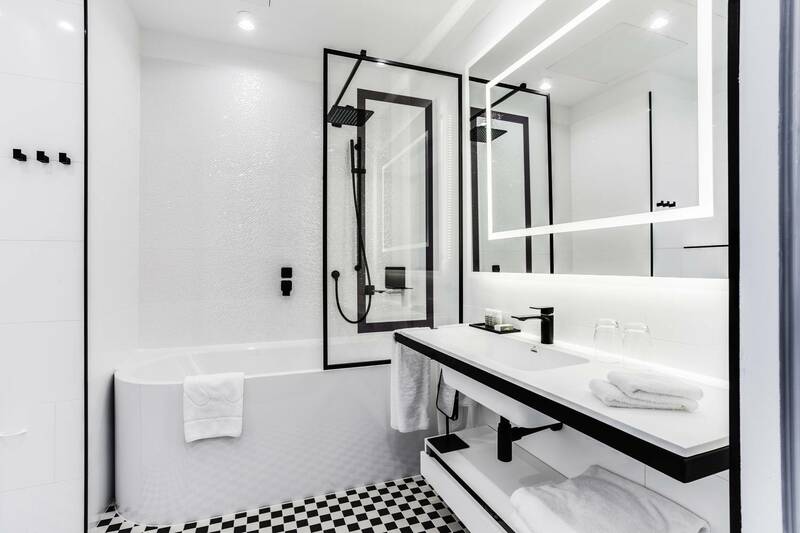 For the white guest rooms, the Hotel Indigo Warsaw Nowy Świat has chosen the Kaldewei Conoflat shower surface in Alpine White matt from the Coordinated Colours Collection. All of the showers, installed at the hotel, offer the greatest possible safety underfoot thanks to the Secure Plus anti-slip finish.